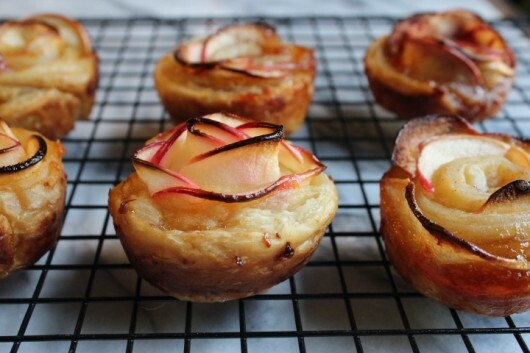 This week, to celebrate the start of apple season, I made some scrumptious little desserts called “Apple Blossoms.” The flower petals are thinly-sliced apples, arranged on strips of store-bought puff pastry dough. Looking for an elegant tea-time treat or after-school snack? This recipe is for you. To start, tip some lemon juice and water into a microwave-safe bowl. Did I ever tell you that I tried to grow my own apples? I planted 5 heirloom varieties back in 2003. To my horror, the trees attracted every pest and disease known to the botanical kingdom. And as a result, today only one tree remains. 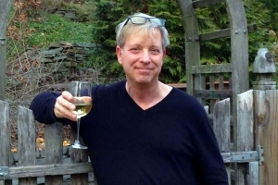 It’s called ‘Sops of Wine,’ and it produces — I’m not kidding — exactly 1 apple per year. And cut them in half through the stem end. 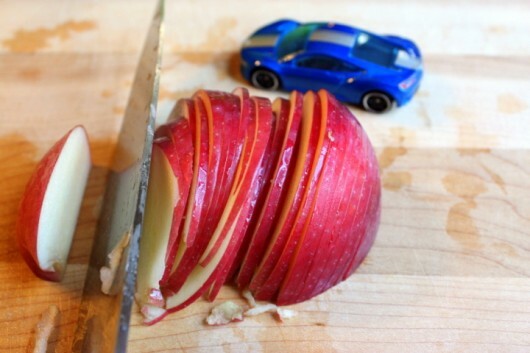 While a careless motorist looks on, cut the apples into very thin slices — about 1/16th-inch thick. If your knife skills aren’t up to snuff, use a mandoline. 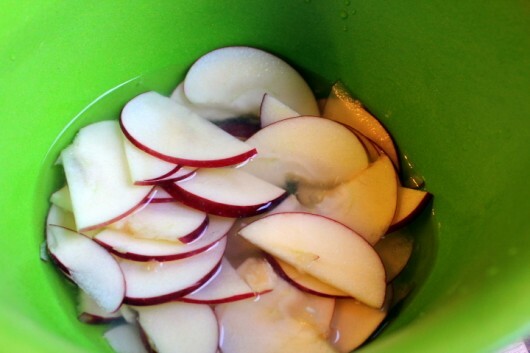 Drop the apple slices into the bowl of lemon-water. Then cover the bowl with plastic wrap, and heat in the microwave oven until the apples soften and become flexible — about 3 minutes. Set aside. Meanwhile, in a small, microwavable bowl, mix 1/4 cup apricot preserves with 1 teaspoon sugar and 1 teaspoon water. Heat, uncovered, in the microwave until the mixture bubbles — about 45 seconds. Stir. Now unfold a sheet of thawed but cold puff pastry dough, and place it on a lightly-floured surface. 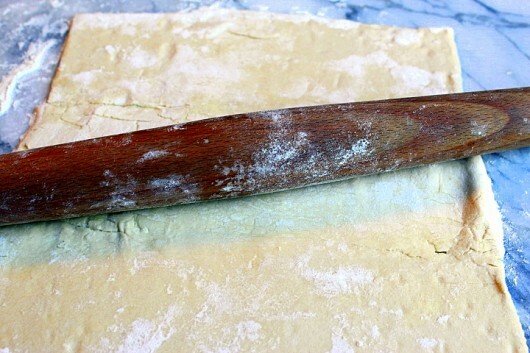 Press the dough with a rolling pin to remove creases. 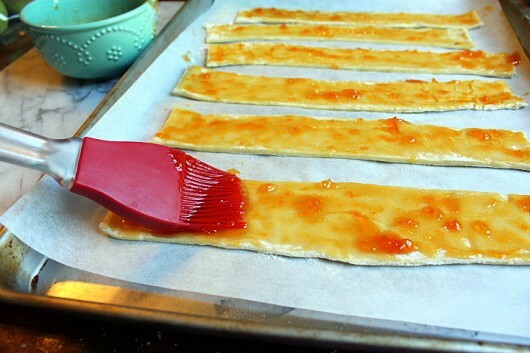 Cut the pastry into 6 equal strips, and place them a parchment-lined baking sheet. Chill in the fridge for 5 minutes just to firm up the dough. 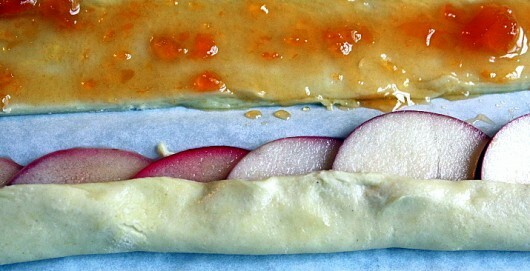 And arrange the apples on the top portion of the pastry strips, in a slightly-overlapping row. Position the apples so they are half-on, half-off, the dough. I hope these directions make sense to you. I’m trying my best here. Oh. 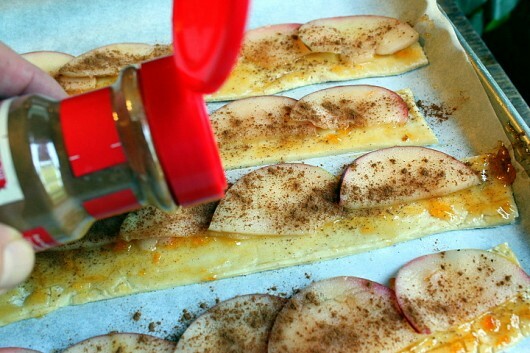 For added flavor, you can toss some cinnamon over the pastry strips. True, the flowers will look prettier without the added spice. But they won’t taste as good. Fold over the bottom half of the pastry so that it joins the top half. And admire your beautiful creation. 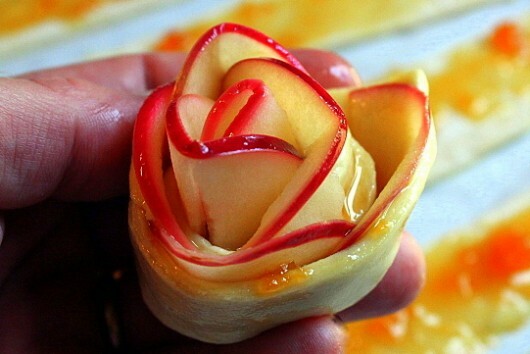 Note: If your apples are too thick or too firm, they will slip out of the pastry when you roll up the pinwheel. Just do your best to push them into the dough. Place the pinwheels in the openings of a well-greased muffin tin. I sprayed my tin with baking spray. Baking spray contains flour. 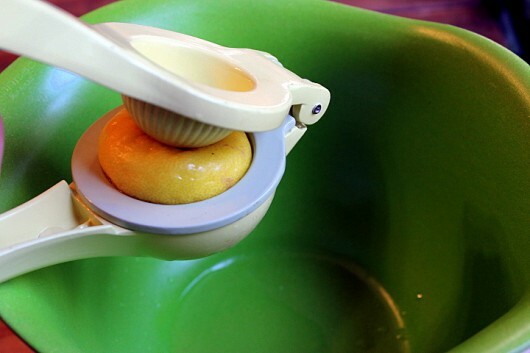 If you use a silicone muffin “tin,” you won’t have to grease it. Pop the desserts into the fridge. Meanwhile, adjust the oven rack to the lower-third position, and preheat the oven to 375°. 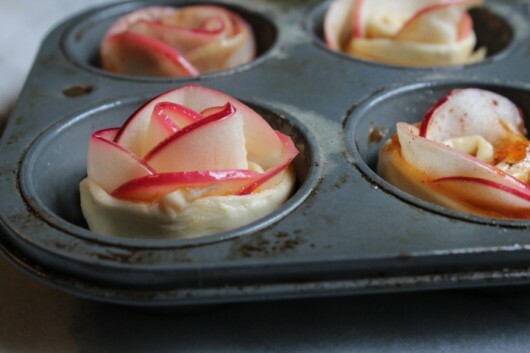 Bake the blossoms until the pastry puffs and turns golden — 35-40 minutes. And to avoid burnt apple slices, check the oven after 20 minutes. If the apple tops are blackening, quickly cover the muffin tin with a sheet of aluminum foil. Then continue baking as usual. Immediately unmold the blossoms, and set them on a wire rack to cool. When the desserts are cool to the touch, give them a dusting of confectioners’ sugar, and serve. Oh, baby. Come to papa. 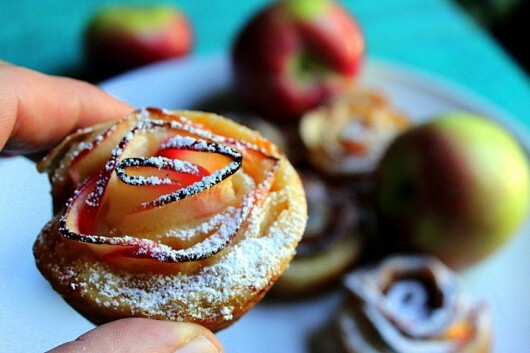 Think you’ll give these puff pastry Apple Blossoms a whirl? You can let me know by leaving a comment. Beautiful to behold, and scrumptious to eat! Put the lemon juice and 2 cups water in a medium-size, microwave-safe bowl. 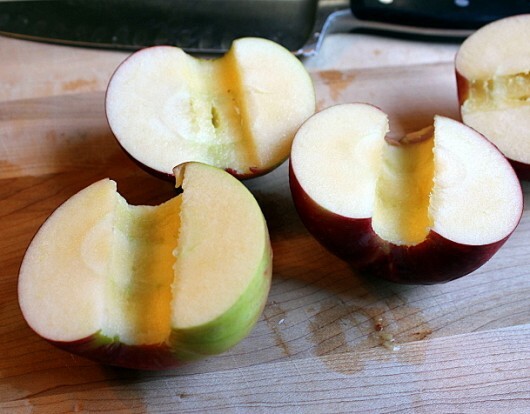 Then core the apples, and cut them in half through the stem end. Using a sharp knife or a mandoline, cut the halves crosswise into 1/16th-inch-thick slices. Transfer the slices to the bowl of lemon water, cover with plastic wrap, and heat in the microwave until the apples become soft and flexible -- about 3 minutes. Set aside. 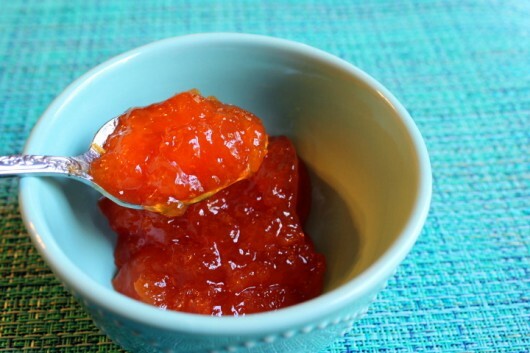 Scoop the apricot preserves, sugar, and teaspoon of water into a small, microwave-safe bowl. Microwave uncovered until the mixture starts to bubble -- about 45 seconds. Stir. Unfold the puff pastry dough, and roll it out just enough to remove creases. 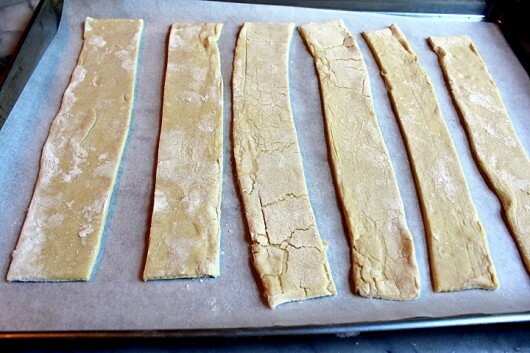 Then cut the pastry into 6 equal strips. 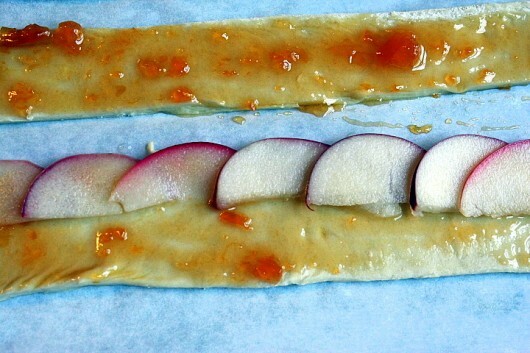 Place the strips on a parchment-lined baking sheet, and let them chill in the fridge for 5 minutes, just to firm them up. Set the muffin tin in the fridge. Meanwhile, adjust the oven rack to lower-middle position, and preheat the oven to 375°F. Bake until the pastry puffs and turns golden -- 35-40 minutes. Tip: check the oven after 20 minutes have passed. If the apples are becoming singed, quickly cover the muffin tin with aluminum foil, and continue baking. Unmold the desserts, and let them cool on a wire rack. Before serving, dust with confectioners' sugar. Oh, my God! These are the cutest things I’ve ever seen. I will make them this weekend. Where do you find these recipes, Kevin? Definitely taking to the next party. This will be the talk of the Women’s Institute meeting next month in Prince Edward Island. Thank you Kevin! I love everything you do, and can’t wait to purchase your cookbook. You should try to graft it with a variety that is more disease resistant. That desert is very elegant. Wow ! I am impressed! These are so beautiful! A truly lovely presentation. Beautiful, delicious, and—vegan by accident! Thank you, Kevin!! Oh you clever clever man!! I have to try these. they are too pretty to bite into. Need to get the ingredients first. I have a solution for adding the cinnamon. Mix it into the apricot jelly. It won’t deter from the looks of those pretty blossoms but the taste will be there. These are a REALLY CLEVER idea. Looks great. I think I’ll make them for my guests tonight. We’ll see how they work out. Should I save one for you, Kevin? Hi Diane B – Add the cinnamon to the apricot preserves? Great idea! Hi John – I’ll gladly eat the entire batch. So elegant! Can’t wait to try. Thanks for the recipe! Beautiful! I’m going to try this with my quinces! And why not almond paste in place of apricot jam? Endless scrumptious variations spring to mind! Thanks! Lovely. What do u think happened to the farmers market garlic cloves I planted before the winter.nothing grew. Hi David – Ooo, almond paste could make a grand filling. Let me know how it works out for you! These look amazing 🙂 I have 3 apple trees on my lot that were here when I bought the place . The only on I know for sure is the Red Delicious…they are usually loaded with apple though until this year when an over large population of squirrels in out subdivision stripped them while they were still green 🙁 I used to like squirrels. Beautiful creations, very clever. got to try this. Thank you. Oh Wow!! I can’t wait to make this! These are gorgeous and your instructions are very clear. Perfect again, thanks Kevin. Kevin, these are wonderful. Very clever!!!!!! Kevin, while these look very delicious, the puff pastry I have found in stores contains high fructose corn syrup which is VERY BAD for health. 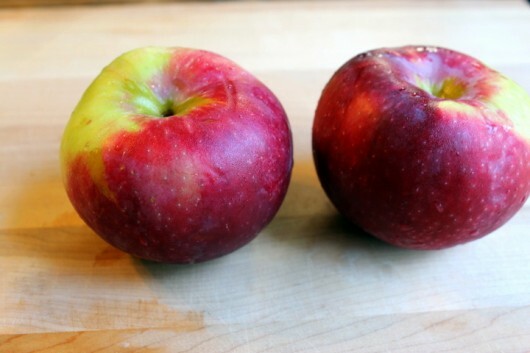 I will NOT buy nor eat anything with high fructose corn syrup or GMOs in it or made with them and I don’t buy or eat “foods” full of herbicides and pesticides, etc.. Also, watch out for Arctic apples, they are GMO. I may spend a lot more on REAL food but a whole lot less on “health” care. So, I’ll NOT be making these. I’ve made a lot of your other recipes, all very delicious and loved by all who ate them! Thank you, Kevin. Kevin, I made these earlier this summer for a party of 20 (mostly gardeners) where everyone brought a part of the meal. They are not difficult but they are time consuming, glad I started early in the day. I got rave reviews… not only are they sooo beautiful, but delicious as well. I am glad you have included this recipe in your repertoire as you need to see pictures to understand the mechanics to making them and your humor and narrative serve to make it more fun! Cheers! 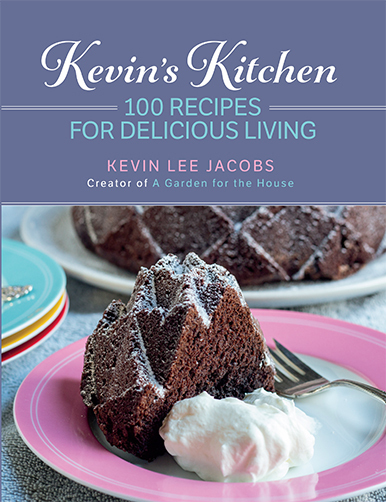 Hi Kevin, I like all your recipes and the look of them! These look so delicious and beautiful but I never used the puff pastry and could you prepare these the day before? I need to make at least 14! Thank you!!!!!! I saw a quick video for these on a Spanish site, but there were no details attached. I have been wanting to make them and now here you are with the recipe! Thank you! Hi Dianne – I’m lucky to have 3 terrific orchards near me. The ‘Paula Red’ apples that I used for this recipe came from Golden Harvest Farms in Valatie, NY. So cute! My children will love these. Wow so pretty and easy to make I must try this! Do you have a gluten-free version of dough you’ve used? I have 10 geranium starts on the back patio wall. Since most of them will winter in the basement under grow lights, I can’t bear to cut up my hanging baskets until the last minute before a freeze! These look so good! We have many old apple trees with lots of apples this year. I will definitly try these beauties. Thanks! I found your site about 3 years ago while I was recovering from brain surgery. I have to tell you that yours is the only site I continue to enjoy week after week since my recovery. Love your inspirations, photos, recipes and humor. Thank you! 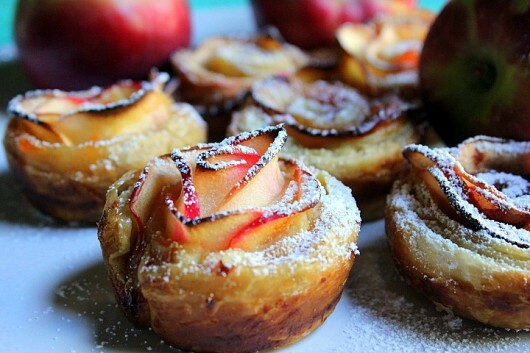 Hi Kevin…this apple blossom recipe looks amazing…can’t wait to try it. Happy Apple Season to you too! hmmm puff pastry sounds perfect …I have to be gluten free so i think i will try it with a short bread recipe from Bobs Red Mill shortbread mix and see what happens. Man these are cute!! I received a wine box of apples from a customer, and made apple pie filling for later. But this was the perfect recipe to use the last of the apples .Wonderful recipe! Well, aren’t these just the cutest desert!! Thanks for sharing. OMG those are just so cute – can’t wait to try !!! Thanks for sharing – I love your emails!! This look even more delicious after I read the recipe. The same happened with the tomato pie. Then I made the tomato pie and ate way more than I should !! !I will try this for my next party! I had to chuckle at your apple tree story. I planted 3 myself, and have lost one already, another about to go, and hardly a tiny apple to show for the work. I laughed at myself when, about 2 years after I planted them, and was already struggling… my next door neighbor emailed me that she was overwhelmed with all the apples from her (5-6) trees, and that I was most welcome to come at any time and harvest as many as I’d like! I said that I should have been cultivating my relationship with my neighbor instead of my trees! Now, I just visit her and enjoy the fruits of her labor! I do take her blackberries, squash and other goodies from my garden so it works well for both of us. Thanks, Kevin, for yet another wonderful recipe. Even if I manage to mangle the rolls I’m sure they will taste wonderful. I love apples and puff pastry! How can I lose? Literally made my mouth water! So fancy and pretty! fyi, the puff pastry I bought was a square and folded into thirds already – so no need to remove the “creases.” I just cut along the creases for the strips and cut each one in half. Easy peasy. I made these for company today. They are awesome. They look great and taste even better! Thanks Kevin. Another big hit. My husband has become a major fan of yours. Hi Nancy and Erlyn’s – So glad these pastries worked out for you! Kevin, with having quite a few guests recently, I have been trying out some of your recipes. The pumpkin bread was a big hit. 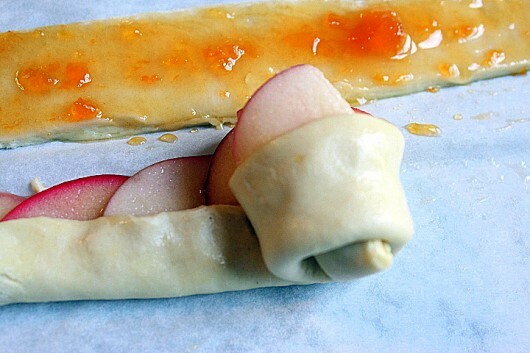 I found rolling up these little apple pastries a bit tricky but took your advice and pushed the apple slices back into the fold. They were very forgiving and looked pretty when cooked. Not quite as perfect as yours but I got no complaints from the recipients. Delicious. This certainly is a ‘wow’ dessert – especially served with thick cream. I just wanted to tell you that I will be making these in the morning for a group of people. They look so easy to make. Dr. Oz had a person making these on his show the other day. I will let you know how they turn out. I am disgusted with some of the comments on here. Grow up people. Hi these look so fun! Can I make them ahead and just bake when I arrive at my hostess’ home?? How far in advance can I make these? 1 hour? 1 day??? 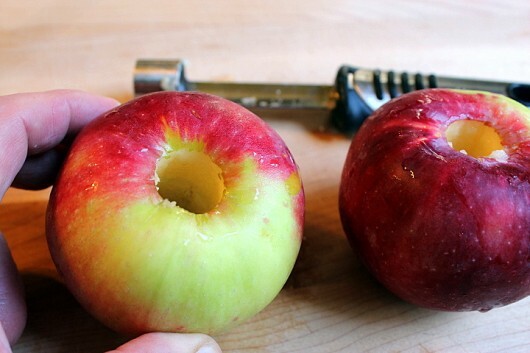 Although these take a bit of manipulation, at least we don’t have to peel the apples. 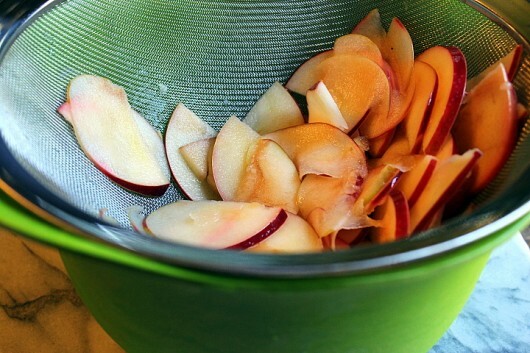 I love recipes where the peel is used because it’s such a waste to toss the healthy skin. And these are so beautiful, as well! Thanks, Kevin! This is a perfect “little sweet” to serve with coffee at the end of a dinner or for afternoon tea. Thank you, Kevin! I stumbled upon your blog this weekend, and then spent the entire weekend reading. All your recipes sound delightful, and I can’t wait to make them. I wish, however, that I had anything resembling a green thumb to try my hand at gardening. Regarding this recipe, I had seen it last year on another website, and have made it several times. Instead of sprinkling cinnamon on to the apples, I sprinkled it over the preserves, so you get the taste and doesn’t ruin the “look”. Hi Patil – Thanks for the cinnamon-on-preserves tip. Have fun on your journey through this crazy website!